Between the traveling de Clermonts and the description of Hubbard, how could we NOT hearken back to vampire lore? Description: We meet Andrew Hubbard! According to Gallowglass and Hancock, we probably should've met him much earlier. Our initial impressions of him range from a creepy cult leader, to the altruistic ruler of a land of misfit creatures; we discuss this, and how Diana Bishop is the one who has to fix this mess that Matthew Clairmont has created for her (again!). We forgive you, Matthew, but boy! You irritate us sometimes! Stay tuned for our reaction to the ADOW TV trailer, and news that was new to us at the time of recording. Long episode, but worth it to stick with us until the end! For newcomers to the series: We'll start with the basics: The books in discussion are A Discovery of Witches, Shadow of Night and The Book of Life. Together they make The All Souls Trilogy by Deborah Harkness. * According to this IG post from Sundance Now, US viewers will have this series in early 2019. * UK viewers will have this series 14 September 2018 via SkyOne. * (01:57) – This podcast is brought to you by our Patrons! 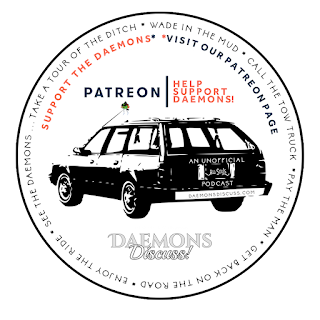 To become a patron all you need to do is visit us at Patreon.com/DaemonsDiscuss and become a member. See what level tier you'd like to join us! 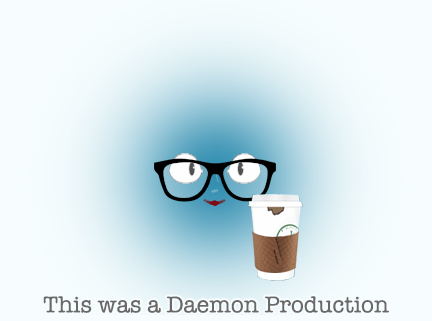 All tier levels will receive access to our exclusive Daemons Discuss! The Aftershow podcast. * (03:24) – Thank you to our Discussers Ana, Lisa, NE Angela, Michelle! Full emails can read here! * (13:46) – This chapter discussion is brought to you by Kathryn Quirk! Thanks Kathryn! 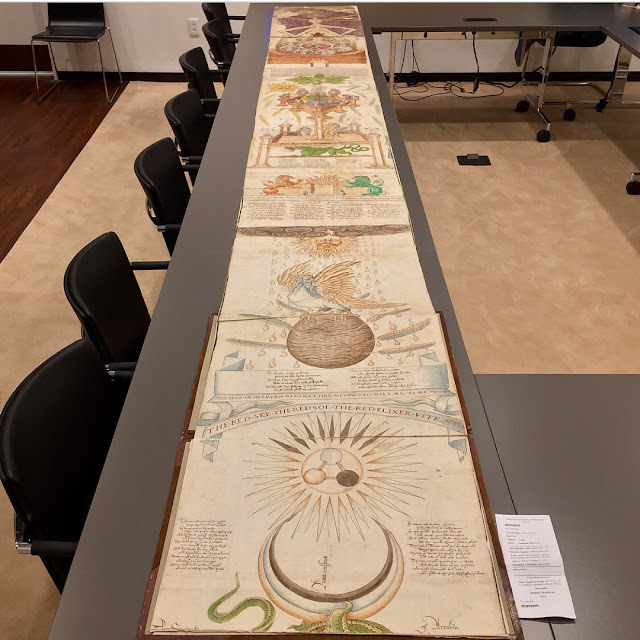 Check out the Ripley's Scroll from the Beinecke Library! * (14:40) Lab coats and eau de pickle. Ripley's Scroll - Deb has shared the one from the Beinecke's Rare Book & Manuscript collection. You can get a closer look on our IG page! "Prim Victorian" — we discuss the juxtaposition between the Elizabethan era vs. the Victorian era. “Matthew,” I murmured. The countess’s maid, Joan, was standing right behind us. “You’re behaving like a prim Victorian rather than a bawdy Elizabethan,” Matthew said, laughing. Beardy goodness. Yup, we went back to that ditch to visit the scene of the original crime. Alchemy and our ignorance of it: proof is displayed in this episode. Sweet Robin — the dude that supposedly undid the virginity of Queen Elizabeth. Mary was married at 15. Of Mary's mother: “She died alone and embittered, like most Dudley women before her. 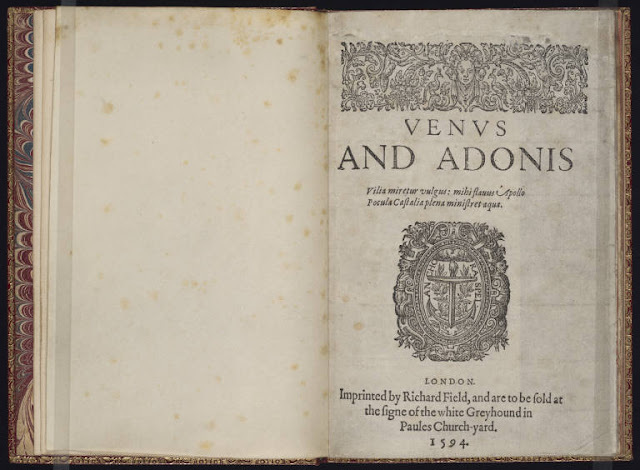 Her greatest triumph was marrying off her fifteen-year-old namesake to the forty-year-old Earl of Pembroke.” “Mary Sidney was a bride at fifteen?” The shrewd, vibrant woman ran an enormous household, reared a pack of energetic children, and was devoted to her alchemical experiments, all with no apparent effort. Now I understood how. Lady Pembroke was younger than me by a few years, but by the age of thirty she’d been juggling these responsibilities for half her life. 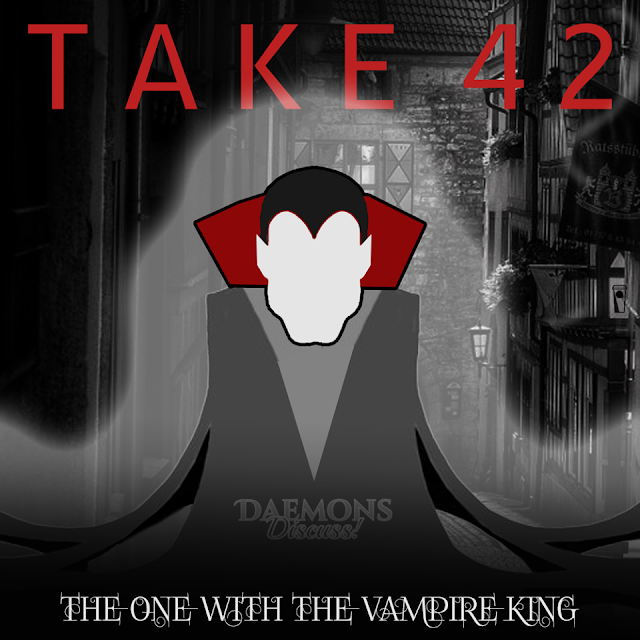 We spin into a conversation about Claudia of The Vampire Chronicles. Father Hubbard wants to see them. 🧛🏻‍♂️YIKES! Matthew thinks it's time to kill maim the messenger.“I see.” Matthew’s voice went flat. There was a blur of black and silver, and his polished dagger was quivering, point first, in the doorjamb near Corner’s eye. Matthew strolled in their direction. Both vampires took an involuntary step back. “Thank you for the message, Leonard.” He nudged the door closed with his foot. Why should we care about who made Hubbard? This is later revealed to be quite important, indeed. * (40:04) – Enter Gallowglass and Hancock! Time to meet the Vampire King! Matthew and his #tidefail -- again. “We have plenty of time.” Matthew’s tone was dismissive. “You never have understood the tides, Matthew. I assume we’re going by water, since you think the Thames isn’t really part of the city either. If so, we may already be too late. Let’s move.” Gallowglass jerked his thumb in the direction of the front door. A favorite, favorite, FAVORITE scene … our vampires all decked out! Once Gallowglass and Pierre were similarly outfitted, Françoise settled a matching cloak on Matthew’s shoulders. Its heavy folds swept the floor, making him look taller and even more imposing. When the four of them stood together, it was an intimidating sight, one that provided a plausible inspiration for every human account of darkly cloaked vampires ever written. Diana deludes herself here. Perhaps this would be simple, and we could meet Andrew Hubbard, show him my wedding ring, and return home. Diana stumbles behind these smooth vampires; We climbed to street level and wended through winding lanes in silence, darting between houses and across small gardens. The vampires moved with the stealth of cats. I moved less surely, stumbling on loose stones and stepping into waterlogged potholes. At last we turned in to a broad street. Laughter came from the far end, and light spilled into the street from wide windows. I rubbed my hands together, drawn to the warmth. 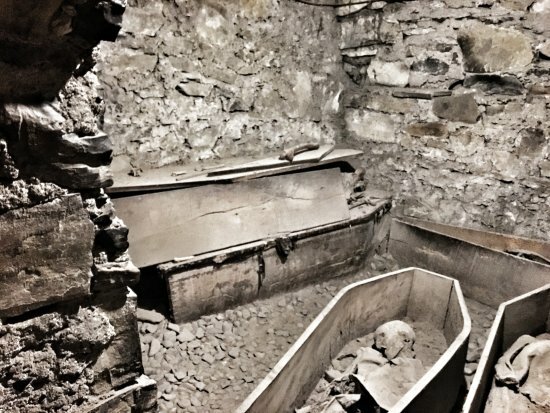 The "Count Chocula" scene; We moved deeper into a warren of tunnels and subterranean rooms and entered a dimly lit crypt. Hollow eyes stared out from the heaped skulls in a small ossuary. A vibration in the stone floor and the muffled sound of bells indicated that somewhere above us the clocks were striking seven. Matthew hurried us along into another tunnel that showed a soft glow in the distance. Angela points the fact that the stage was set for us to opine about Father Hubbard based on the creeptastic surroundings, and Matthew's biased description to Diana. Jean's add on observation: "Pirates of the Caribbean ride, but stinky!" “You’re late” - “You’re late.” The rumble of sound cut through the chatter and set the hair on my neck prickling. “And traveling with a full retinue, I see. “That’s impossible, since we had no appointment.” Matthew gripped my elbow as dozens of glances nudged, tingled, and chilled my skin. 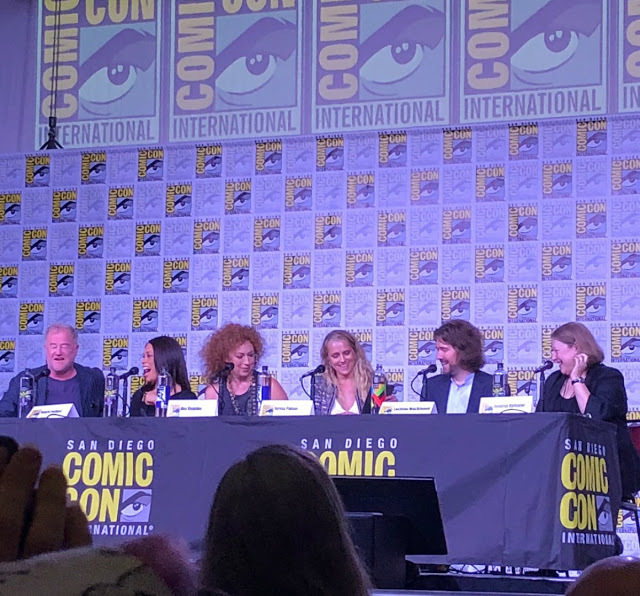 Hubbard’s description - Angela points out that he’s been turned while being infected with the plague and it probably impacted his overall appearance. The vampire’s eyes were the only colorful thing about him. Otherwise he was preternaturally pale, with white-blond hair cropped close to his skull, nearly invisible eyebrows and lashes, and a wide horizontal slash of lips set in a clean-shaven face. His long black coat, which looked like a cross between a scholar’s gown and a cleric’s cassock, accentuated his cadaverous build. There was no mistaking the strength in his broad, slightly stooped shoulders, but the rest of him was practically skeletal. Hubbard has us truly freaked out at this point ---> There was a blur of motion as blunt, powerful fingers took my chin and jerked my head to the side. In the same instant, Matthew’s hand wrapped around the vampire’s wrist. Hubbard’s cold glance touched my neck, taking in the scar there. For once I wished Françoise had outfitted me with the largest ruff she could find. He exhaled in an icy gust smelling of cinnabar and fir before his wide mouth tightened, the edges of his lips turning from pale peach to white. Oh, we have no doubt, Matthew. “We have a problem, Master Roydon,” said Hubbard. “We have several, Father Hubbard. The first is that you have your hands on something that belongs to me. If you don’t remove them, I’ll tear this den to pieces before sunrise. What happens afterward will make every creature in the city—daemon, human, wearh, and witch—think the end of days is upon us.” Matthew’s voice vibrated with fury. Hancock's parting shot: “Your father says a wise man can see more from the bottom of a well than a fool can from a mountaintop. Let’s hope he’s right,” Hancock muttered, “because this is one hell of a hole you’ve put us in tonight.” With one last look, he followed Gallowglass and Pierre through a break in the far wall. A heavy door closed, and there was silence. Hubbard, assesses the situation very cleanly. He points out that they are in a mixed marriage which many creatures find intolerable, she's pregnant, a "time spinner," and Matthew has taken her blood. There are all sorts of problems here, and Hubbard offers a solution. We wonder about the blood song. Could Hubbard hear it? Was he feigning ignorance? Is it a continuity error? Maybe we'll ask the question one day. Diana, requests assistance from Hubbard. “Perhaps you can help me, then. I’m in London to seek help with some finer points of magic and witchcraft. Who among your children would you recommend for the task?” My request erased Matthew’s grin. * (58:59) - Back home. Walter wonders if this concerns the order. “I’m sorry to have called you. My alarm was premature,” Matthew said, his cloak swirling around his feet as he took it from his shoulders. “If it concerns the order—” Walter began, eyeing the cloak. “It doesn’t,” Matthew assured him. Diana persuades Matthew. “We don’t have much time,” I reminded Matthew. Hubbard didn’t know that the baby was Matthew’s, and Hancock and Gallowglass hadn’t perceived the changes to my scent—yet. But this evening’s events had driven home our precarious position. The Battle of Bosworth/War of the Roses ... The Knights Of Lazarus were (according to Deb, and by Philippe's orders) involved. Thanks for the egg, Angela! * (1:03:12) Housekeeping! Brought to you by Nancy Forrester! Thank you, Stephen see fig. 1 below & Wendy for your messages! Fig. 1 -- Richard Field's publishing stamp/logo featuring the anchor that Stephen was referring to! * (1:13:15) Promo break – scroll down, or click here to get a hold of us and/or become a Discusser -- information on joining our Facebook group also located on that page. Those of you with US numbers can text ADOW to 444999 to become a Discusser. Angela brings up the scent; cinnabar and fir/Hubbard’s scent. Jean thinks it has to do church incense. She then finds the connection to Dragon’s blood. Jean notes that Sep. is going to be NUTS. New book/new TV show. We may skip real time read, but you can read with us using our past chapter reads: Our podcast chapter list. Val to Camille (our witchy listener! ), we did research on the gmail address listed in The World of All Souls — which one of you has it? Email us! We're curious! We do a drawing for the emoji contest we had a couple episodes ago. Congratulations, Stacey of A Page Turner's Blog! We do it again in this episode! Please send us reviews if you enjoy our podcast! Angela is WILTING! We are now on Google Podcasts! Thanks to Pippa for featuring us! Oh, and if you ever consider doing a podcast, we totally recommend them! * (1:26:58) -- 😍, because best t-shirt ever!